On Fathers Day Weekend, June 20, the Nicola Valley Fish & Game Club hosted the Family Fishing Day event at the kids’ pond, located between Kentucky and Alleyene Lake. This was the fourth annual hosting of this event and to date by far the most successful with well over 120 people and families attending with well over half being children, including a group of Beavers (boys and girls aged 5 to 7) led by local conservation officer Jeff Hanratty. For once the weather was cooperating, providing much appreciated sunshine and comfortable temperatures. 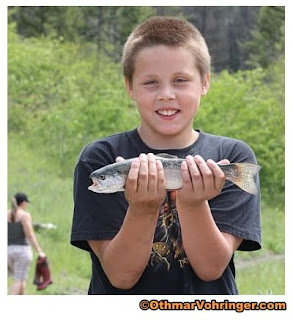 The Family Fishing Weekend is a program initiated by the non-profit Family Fishing Society. 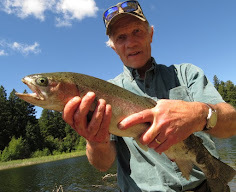 Recreational fishing is a key part of British Columbia’s way of life and the Society’s goal is to celebrate this fact while at the same time promoting it to new anglers, especially children. Sports anglers contribute nearly $1.2 billion annually to B.C. 's local and regional economies while supporting thousands of jobs throughout the province. To maintain this robust industry there must be a strategy in place that continues to develop the vibrant and growing sports angling community and that is where the Family Fishing Day events come in. The event started at 9 am and by the time it was over at 2pm many young anglers caught fish. For some it was their first fish and, judging from the smiles on their faces when they proudly displayed their catch, some of them are probably now ‘hooked’ to the sport! The fish caught ranged from small to a respectable 3 lb. 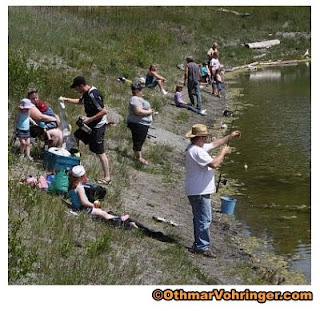 Thanks to the generosity of the angling industry and organizations we had many prizes to give away to the children, among them over 50 Shakespeare rod and reel combos. It goes without saying that such an event would not be possible without the tireless volunteer work of many Nicola Valley Fish & Game Club members assisting in the registration of the anglers, manning the hospitality tent, organizing the event, plus the many guides assisting the anglers and providing their knowledge and tips on how to catch fish. A special thank you to Conservation Officer Jeff Hanratty and his team for the time spent on the event and all their assistance to the anglers. Our conservation officers are an often-underestimated community asset. These fine men and women in uniform do a tremendous job ensuring a future of our natural resources and providing community assistance on events like the Family Fishing Day. All in all it was a wonderful event that each consecutive year grows in popularity far beyond the borders of our region. I look forward to next years Family Fishing Day and hopefully will see even more children attending than previous years. 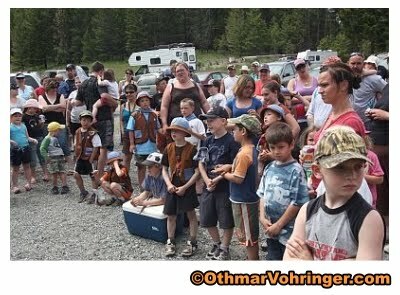 It is important that we get the children outdoors and teach them to become future stewards of our heritage and nature. A large crowd gathered waiting for the registration booth to open. 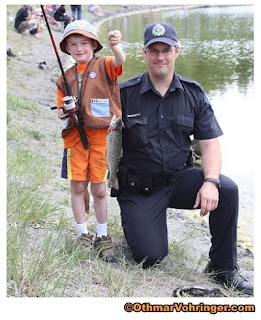 Conservation officers and children play an important role in the future of hunting, fishing and nature stewardship. The smile on this boys face says more than a 1,000 words.